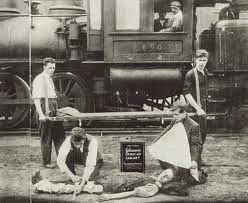 To date, my most viewed post on this blog has been Blood Between the Tracks, which discussed dangerous working conditions on the early railroads. The hazards to railroad employees were often preserved much longer than they had to be, because the companies operating the trains often did not invest in technological innovations that the job safer for employees, such as automatic couplers, until forced to do so by newly passed regulations. Wording it this way, in retrospect, gives somewhat superficial view of the situation. The companies may have lagged behind in preventing injury to their employees, but medical science, like everything other aspect of life directly and indirectly touched by the railroads, was spurred into rapid evolution.